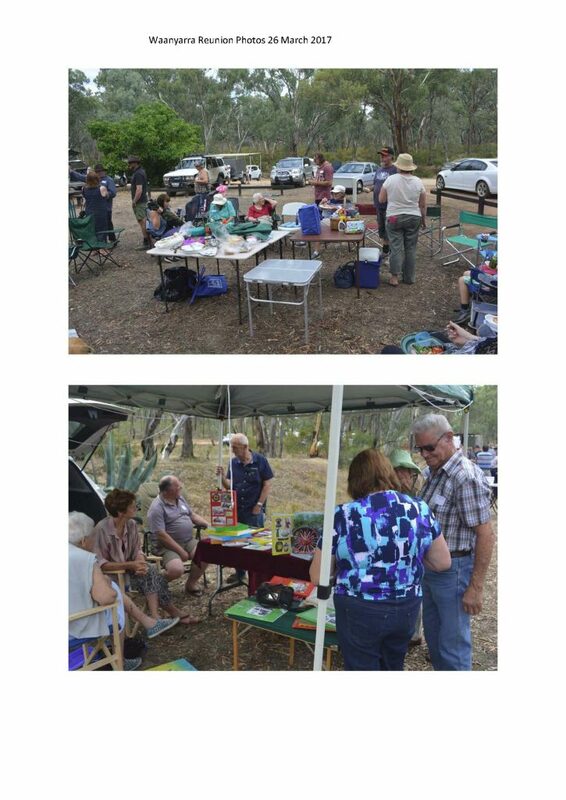 The Waanyarra Recreation Reserve proved a perfect setting for the Waanyarra Reunion on Sunday, 26 March 2017. Once again, we were blessed with fine weather and while the numbers attending continue to decline, there were a number of new people in attendance. Despite this, it was again the lowest attendance we have experienced. So many have died and a large number are too old or incapacitated to travel. In the past, we have had approximately 50 people attend from two families, namely the Morton’s and the Pearce’s who made it their own family reunion and these were missing this year. There were a large number from both the Thorpe and McEvoy families who provided quite a deal of new memorabilia and photos for the display. David Gordon had his Tarnagulla and District histories for sale and Ken and Edna Arnold also had a large selection of district histories available for sale. Ian Belmont sold his CD on the Tarnagulla and Waanyarra Cemeteries and George Swinburne had his display of several hundred newspaper articles from Waanyarra and Tarnagulla as well as Comrie family documents and photos. While Dot Gordon had passed away since the last reunion, Ken was able to bring her collection of photos for display and several members of their family were also in attendance. While Kylie Monk promised a “small group” from the Maryborough City Brass Band, to have the whole Band perform was magnificent and the Band’s performance was again the highlight of the Reunion and was greatly enjoyed by those who attended. It was also appreciated that the Band played before lunch and during the afternoon. We express our gratitude to the whole Band and a collection was held to support the continued maintenance of the Band. John Tully, President of the Goldfields Historical and Arts Society Inc in Dunolly, gave an address on the origins of the names Waanyarra and Jones’ Creek, the “prostitutes “grave outside the Waanyarra Historical Cemetery and the history of Murderers’ Hill. A little more on this below. Thanks to John for this contribution. There was a successful raffle which supports the expenses of holding the Reunion and in all, everyone seemed to have a good time and a number of nice emails were received. George Swinburne is the Convenor of the Reunion, but he could not have coped without the assistance of David Gordon and his daughter Lara, Philip Spencer and John and Jo Nairn who were able to give their time for the set up and packing up at the end of the day and to whom grateful thanks are extended. Unfortunately, while there were some good raffle prizes donated – including a toaster and a hot water jug – the donors did not notify their names, so they cannot be thanked personally. David Gordon, Ken & Edna Arnold and George Swinburne donated books and Ian Belmont donated copies of his CD on the Tarnagulla and Waanyarra Cemeteries. Thanks to each of them and to those not mentioned. Thanks as well as to Lara Gordon, Janet Rowson, Jo Nairn and Janet and Phil Eyles for their assistance in selling raffle tickets and taking up the Band collection. Janet Rowson also distributed Notices in the area before the Reunion and advertising was provided by the Maryborough Advertiser, The Welcome Record and The Korong Newsletter. 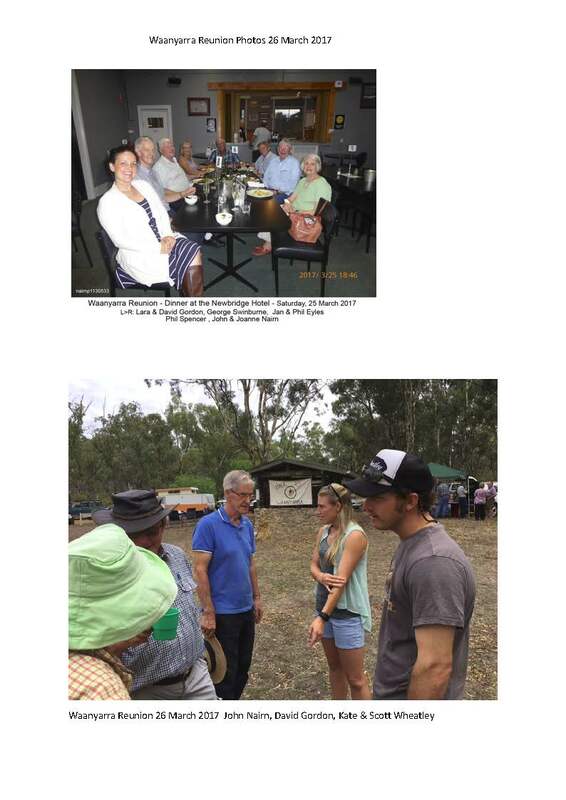 An extensive mailing list of over 600 is maintained by David Gordon of the Tarnagulla and District History Group and Robyn Vella of Loddon Southern Development and Tourism Committee who were also able to circulate notices and newsletters to their email lists. However, to the many who did attend, they seemed to enjoy the day immensely and their support and the support and generosity of the Band is greatly appreciated. Will we be able to hold the next Reunion in 2020? Despite George Swinburne issuing the ultimatum that unless there was a volunteer or volunteers to run the Reunio0n in the future, that the 2017 Reunion may be the last, there have been no offers to take over or assist in the organisation of future Reunions (other than the great support received from David Gordon and Phil Spencer). Further, despite being a successful and enjoyable day, it is disappointing when the numbers attending continue to decline. It is recognised that age is catching up with many Waanyarra supporters and that it is difficult when so many young members of Waanyarra Pioneer families are not really interested. Maybe the time has come when we will have to look at moving closer to Tarnagulla events and participating in Tarnagulla and District Historical Group events rather than have our own day at the Waanyarra Recreation Reserve. This would be disappointing after so many successful years at Waanyarra, which is a very peaceful setting. As stated in the last Newsletter, we are a “great volunteer outfit” and we want you to help preserve the Historic Cemetery and the Reunion at all costs, but we need a younger person to take overall responsibility for the Reunion, the Newsletters and mustering the volunteers. Tribute was again paid to Ken and Roz Morton at the Reunion. Ken formed the Families and Friends of Waanyarra in the early 1980s and was responsible for getting the Historical Cemetery into order including identifying the graves and placing markers where possible and plaques at the entry to the Cemetery to recognise those who were buried there. He also organized the gates and post and rail fence. The original records of the Cemetery were destroyed in a fire many years ago and it was a painstaking job to reconstruct them. Ken was also a trail blazer in putting together the Waanyarra website and publishing the Cemetery records on it. 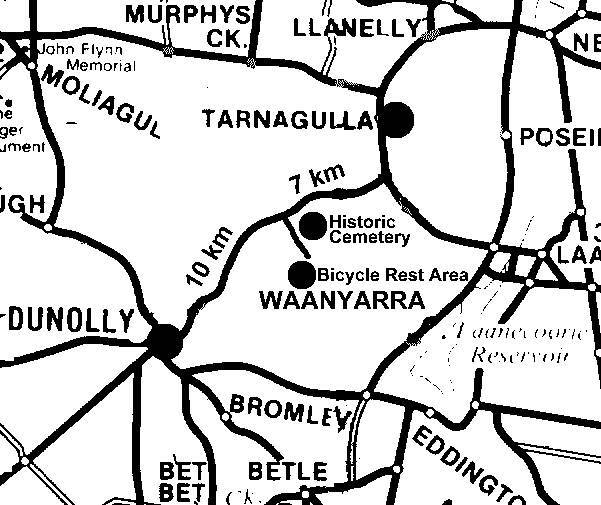 Waanyarra was one of the first websites in the world to publish the cemetery records of a “township” (it was never formally declared a town) and it has been of great assistance to those tracing their ancestors. Ken also organised a number of reunions up until 2001 when he handed over organisation to George Swinburne, who has organised the last five Reunions. Unfortunately, at the age of 86 and with medical challenges, Ken, who went to school in Waanyarra, is no longer able to travel to Waanyarra and we convey our sincere thanks to him for all he has done over many years and for maintaining the website. Roz has been a tower of strength for him as well as his daughter Andi with the website. Maintenance and replacement of the fences surrounding the Historic Cemetery has been carried out over the years and as reported in our earlier Newsletters, a Prison Release Party had 5 visits to assist in maintenance and repair of the front post & rail fence and replacement of the boundary fences and many of you also contributed funds for materials and Allan Brownbill contributed a roll of wire mesh. Phil Spencer, David Gordon and George Swinburne also assisted with the repair and maintenance of the post & rail fence at the front and painting of the picket fence adjoining the front gates and together with David Gordon undertook some clearing works. More recently, David Gordon has secured many of the rails in the front fence that were falling. In the next 18 months, we will need to again apply a protective timber treatment to the post and rail fence followed by a coat of sump oil to provide a measure of water proofing which while not as good as creosote, has again lasted very well. The website is an integral part in maintaining information on the Families and Friends of Waanyarra and disseminating information on the Reunions and on the history of Waanyarra and the families who passed through the area during the gold rushes and since that time. David Gordon and Cameron Clark have also added a Waanyarra section to the District Towns section of the Tarnagulla website http://www.tarnagulla.com and you will find photos there as well. There are a number of histories of families who settled in Waanyarra at www.waanyarra.com and if you can contribute your family history, although it may be edited, it can be posted on the Waanyarra website as can photographs and historical documents. These can be scanned in jpeg format and emailed to waanyarra1@gmail.com. Even one-off photographs or copies of documents will be a good contribution as there are very few photographs of the early days of Waanyarra surviving. Even current photographs or those from more recent times would be gratefully received, as one day these will be historic too. Please have a look in your family records and see what you can find. The name Waanyarra can be traced back to 1849, before the goldrushes. It means ‘little flowing water’. The Aboriginal campsite of Waanyarra was near what we now call Ankers Causeway at Laanecoorie Reservoir. Aborigines didn’t have names for creeks rather names for different campsites along the creek. The Jones’ Creek area was known as Wanga Wanga which means ‘many little hills’. Charlotte Plains was the first squatting station that included the Waanyarra area. It was established in 1840. Donald Simson named it Charlotte Plains after his wife. In 1847, it was subdivided and the eldest brother, John Simson, took Bet Bet Station. This was the land west of the Loddon and west of Bet Bet Creek. John Simson died the following year before he could build his Bet Bet homestead. Bet Bet Station reverted to Donald Simson who renamed it Janevale, after his wife. Her maiden name was Jane. Gold was discovered at Jones’ Creek in March 1853. Reports show that the area was already known as Jones’ Creek. It is assumed the name came from Charlie Jones, a convict shepherd. Charles Jones was born in Ireland about 1811. At the age of 27 he was caught for highway robbery and sentenced at Wicklow with transportation for life. He arrived in Sydney on the Westmoreland in 1838. In 1844, he was assigned to W H Bacchus (Bacchus Marsh), then Hector Simson, then transferred to Donald Simson, Charlotte Plains in 1846. He was granted a ticket of leave on 3 July 1846 and on 10 August 1846 transferred to John Simson who held Bet Bet Station. As Bet Bet Station was just in the process of being subdivided from Charlotte Plains, new shepherd’s huts would have been required. It is assumed that the hut at Waanyarra was occupied by Charlie Jones and known as Jones Hut. The creek would then become Jones’s Creek. After John Simson died in 1848 Charlie Jones was assigned to another station owner at Yass, NSW. He came back to the Victorian goldrushes and lived at Star Hill between Dunolly and Eddington. He died there in 1886 aged about 72 and was buried in the Dunolly Cemetery. At the side of the road near the Historic Cemetery is what is known as the ‘Prostitute’s Grave’. This is a neat well-tended grave with a painted silhouette of a woman. There is a local story of a prostitute that died and the Trustees of the Cemetery would not let her be buried within the cemetery. Recently Facebook comments have stated her name was Yvonne and that she was half Aboriginal and that she only had one leg. None of this is backed by historical documentation. There is no known reference to an Aborigine in Central Victoria called Yvonne. John Tully remembers the grave in the 1980s before it was restored. It was much smaller and had no stones around it. It was just a mound of dirt. The oldest person he could find who had any recollection of the grave was Bill Barker, the butcher in Dunolly. He maintained that in the 1930s he did the meat deliveries to Waanyarra for his father. There was a miner camped by the creek and when his dog died he buried it beside the track. As for the Waanyarra Cemetery, there were no regulations prohibiting the burial of anyone. Gold was first discovered in the area in 1853 and the Waanyarra Cemetery opened in 1858, so there are several years where it is not known where the people were buried. There are seven graves amongst the diggings, some 200m west from the cemetery. These would date from this early period. The miners dug all around these graves and dug a trench to mark the boundary. Not far from here was supposed to be the prostitute’s grave but this area was dug up in the 1930s. So, all that we know about the prostitute is that she died in the 1853 to 1858 period, nothing else. Her name or ethnicity remains unknown. Hugh McLean & Robert Dunlop were two Scottish miners who lived in Long Gully, Waanyarra. The suspected story is that they found good gold and took it to Chinaman’s Flat (Timor) to sell it so as not to create any local suspicion. They spent the night at White Hills (Havelock) and returned home the next day. At a shop in Dunolly it seems that Job Neil and or Bill Brown noticed that they were carrying a lot of money. The two went ahead and met up with Richard Dunbeer and his partner Mary Ann Dodd and convinced them to take part in robbing McLean and Dunlop. Mary Ann Dodd acted as lookout. It all went wrong and McLean and Dunlop were murdered, their bodies carried to an old shallow mine hole. Murderers Gully, now known as Murderers’ Hill was where the bodies were found and has probably now been identified through the descriptions: – 500 yards off Old Jones Creek Road, 2½-3m from Dunolly, 1-2 m from Jones’ Creek, ¼ mile from the road [Dunolly-Tarnagulla Rd]. A gully, thickly timbered, below a high mountain [Murderers Hill or ridge nearby] Bodies 800 paces from where murder took place. A large tree where Mary Ann Dodd was lookout was cut down for a telegraph line [Dunolly-Tarnagulla Rd]. McLean and Dunlop were mates and had been mining at Maryborough in 1854. They were in the Dunolly area late 1856 when Mary Dunlop gave birth. In February 1857 Robert Dunlop was living at Burnt Creek when he was on a jury for an inquest. Sometime over the next few months they moved to Long Gully, Waanyarra. Mary Dunlop remained in the area with her children. She was a widow for twenty years before she married William Callister. He died a few months later and then Mary died the following year aged 50. Her maiden name was Guthrie. Several weeks after the murders an African American named William Henry Dean came across the bodies and reported it to the police. Dean was arrested as he had blood on his pick. Nobody questioned why he would still have blood on his pick a month after the murders. After a few weeks in the lock up, he remembered dropping his pick on the floor of a butcher’s shop in Dunolly. This was confirmed by the butcher and Dean released. The government offered £100 reward for the murders. In February 1858 Samuel Dryden, John Anderson, Robert Jones and Thomas Dearling were arrested. Probably dobbed in by someone hoping to get the reward. There was little evidence against them and after being remanded the judge released them. One of the accused, Thomas Dearling, stayed in the area and was at Wehla in 1870. Then in February 1859 Richard Dunbeer gave himself up at Carisbrook and implicated Job Neil, Bill Brown and Mary Ann Dodd in the murders. Mary Ann Dodd was arrested at Dunolly. She had two children, the father of one being either Richard Dunbeer or Job Neil. Job Neil was arrested at Pleasant Creek (Stawell). Bill Brown was never found. There was much conflicting evidence at the trial. Mary Ann Dodd’s account was very descriptive and put the blame on Job Neil and Bill Brown. Her statements about the murders matched what the police already knew. Job Neil said he was in South Australia at the time and could get witnesses over to prove it. Other witnesses placed him near the scene of the crime on the same night. In the end the conflicting evidence swayed the jury and they were found not guilty. The only one who went to gaol was Richard Dunbeer (called Charles Dunbeer in Flett’s book on Dunolly). He received three years’ hard labour for assault and Mary Ann Dodd was scarred for life. As she was being moved along a corridor in the Castlemaine Gaol with her two children, Richard Dunbeer who was in the same corridor and still grieving over her leaving him for Job Neil, lunged at her and bit off her nose and swallowed it. 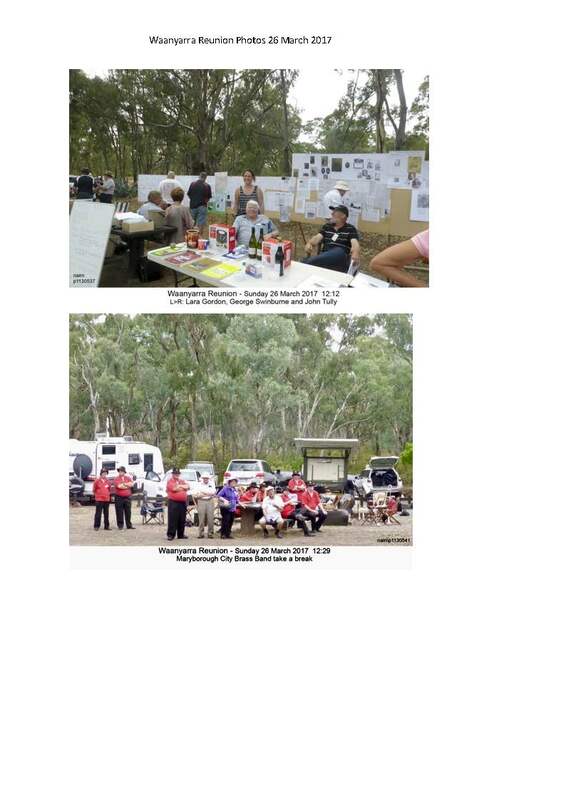 If you have photographs taken at the Waanyarra Reunion could you please put names to people in the photographs, and email these to George Swinburne at waanyarra1@gmail.com so a selection of photographs with names are able to be posted on the Waanyarra and Tarnagulla websites. Please do this as soon as possible. BRUTALITY – This morning whilst the prisoner Dunbear, who has been so repeatedly remanded on a charge of perjury in the Jones’s Creek murder case, was being removed from the police court to the gaol, he seized his paramour, Dodd, and inflicted a severe wound with his teeth upon the nose of the woman.- Castlemaine Advertiser. A well-known resident of Eddington, named John Polson, was brought before Mr F. K. Orme. P.M., today, at the Police Court, by Constable Weeks, on warrant, charged with stealing four head of cattle, the property of Highett and Carey, farmers, Jones’s Creek. He was remanded to Friday, bail being allowed in two sureties of £100 each. It was not obtained, and prisoner was removed to the lock-up. Sergeant William Lynas, who has been many years in charge of the police station here, has resigned his position in the force in order to enter into farming pursuits near St Arnaud. He was much esteemed in the district. The Prospecting Board visited Waanyarra and Tarnagulla yesterday, and inquired into the applications of the Waanyarra Prospecting Association at Waanyarra, and the application of the New Kangaroo Company at Lays, the Wanda Company, Yorkshire Company, and the Prince of Wales and Old Poverty Company at Tarnagulla; after which the various mines were visited and inspected. The Board stopped for a short time at Llanelly, and inspected the lines of the Cambrian, the Hellass, and sandstone reefs, which were, all formerly very rich, after which they proceeded to Inglewood. DISCOVERY OF A LARGE NUGGET. January 23. A compact solid nugget of gold weighing 99 oz 2 dwt. was sold today in Dunolly. It was obtained on Monday at Jones’s Creek, five miles distant from Dunolly, by Messrs. Pearce and McEvoy, who were puddling in that locality. The nugget was obtained in old workings, only about 6ft. from the surface, in a very small corner of a wall, between two old claims which had been left untouched previously, although the ground all about had been thoroughly worked. The find is fortunate, as the men had determined to go to other work after a few days’ further trials. Messrs. Fotheringham and party got a nugget weighing 6 ½ oz. on Monday in their claim at the Murphy’s Flat rush. An elderly lady, Mrs. Gourlay, of Waanyarra, tripped and fell into a fire on Friday, and was so badly burnt that she is not expected to recover. A little girl, aged five years, daughter of Mr W Bofil, of Waanyarra, had a very narrow escape from being burnt to death. She was riding in a dray with her father, when a spark from his pipe caught her clothes, which were soon in flames. Fortunately, the child, although badly burned, was saved from an untimely death by her father, who had the presence of mind to roll her in some bags which he had in the dray. Tarnagulla, 7th February. A number of bush fires have been burning around the town this week. Yesterday a serious fire broke out at Waanyarra, and after raging all night in the bush, this morning burnt a quantity of fencing and grass on the property of Mr. J. Jarry. The fire was today extinguished about twenty yards, from the home of the latter by a number of civilians and neighbours, thus saving the home. 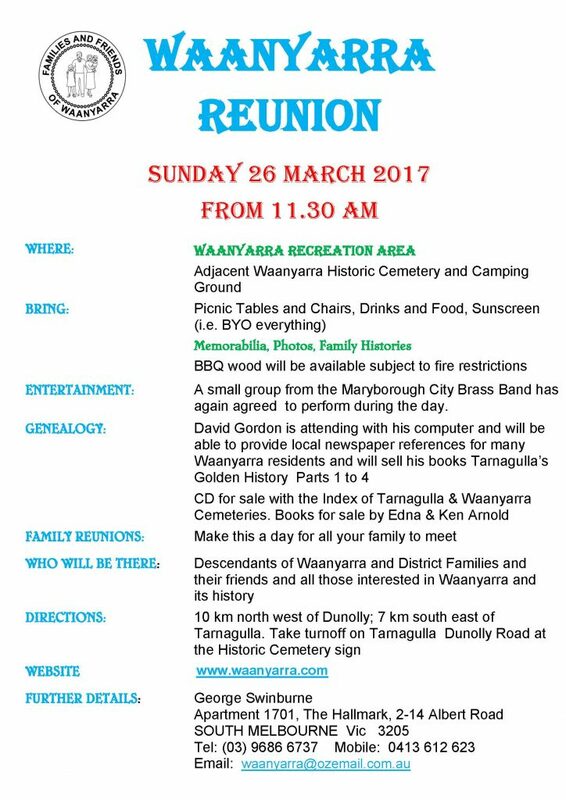 This is a friendly reminder to encourage you and your friends to join us in the lovely bush setting at the Waanyarra Recreation Area on Sunday 26 March 2017 where you can again listen to a small group from the Maryborough City Brass Band, renew old acquaintances and make new friends who have an interest in Waanyarra and its history and enjoy a good day out. A copy of the Notice sent out is attached together with the Newsletter which has further details. This site is dedicated to the historic “Golden Triangle” locality of Waanyarra, in Central Victoria, Australia. Information of its history, pioneering families and fabulously rich gold mining past will be found here. 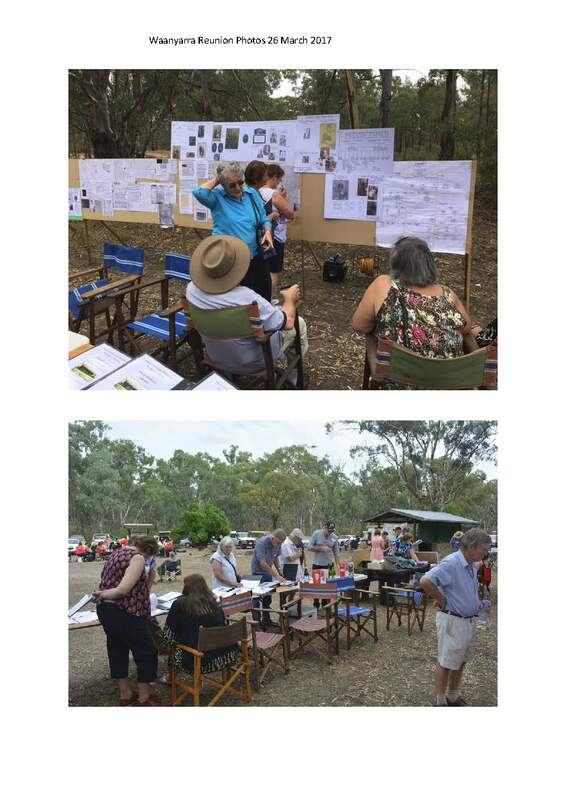 The efforts of the “Families and Friends of Waanyarra” and other interested people to keep the history of the area alive—bring the descendants of the pioneering families together—and restore and maintain the historic Waanyarra cemetery will also be given some coverage. Genealogists seeking information on people in the area in bygone days may find some vital clues in the cemetery records which have been reconstructed over the past ten years. Please visit the “Unidentified Photos” posts if you think you can help. 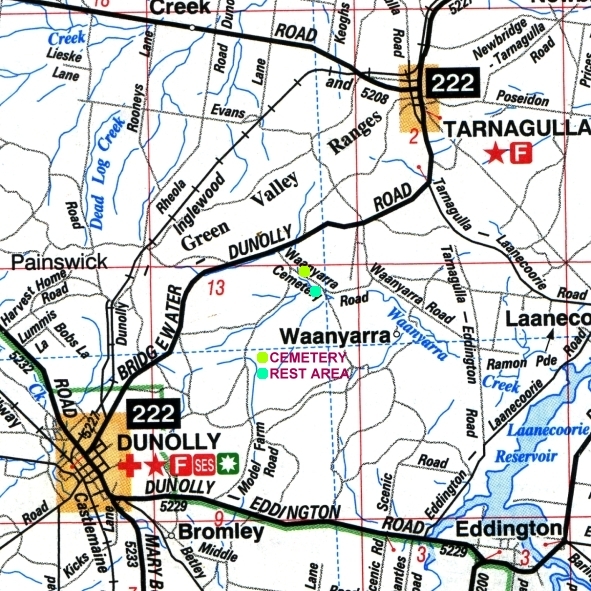 We have added a new page to the site where articles of common interest to the Waanyarra / Tarnagulla areas can be posted. Click on the Tarnagulla activities tab at the top of this page for the latest news.